Although his awkward social skills obscure it, Sydney Carton loves to visit the Manette house. After Mr. Stryver informs him that he's given up his plans to propose, Carton visits Lucie for a private conversation. Carton's earlier insults of Lucie were just a show. From his visits, it is clear that he loves and admires her for her compassion and goodness. Lucie is astonished when Carton breaks into tears over his wasted life during the visit. She asks if she can help him, if she can persuade him to live a better life. Carton says no, that his life was over long ago. But Lucie responds that she believes he has it in him to live a much worthier life, and that she can help him. Carton's past is a mystery. Not unlike Dr. Manette, Carton has been imprisoned in his own depression since some trauma in his youth. Even he does not anticipate the great deeds he is capable of, but Lucie does. Carton tells Lucie he loves her, that she is "the last dream of [his] soul." But that even if she loved him back, he would probably just make her miserable. Carton asks only one thing: for Lucie to confirm that there is still something in him to pity, some shred of humanity to sympathize with. She does and Carton tells Lucie he would do anything, even give his own life, for her and the family she loves. Prophetic words. Carton's soul dreams of Lucie's pity, of being forgiven and welcomed by her boundless compassion. Carton sees this compassion as the most important thing in the world, and with the strength he derives from Lucie's faith, he would do anything to protect it. Fyfe, Paul. "A Tale of Two Cities Book 2, Chapter 13." LitCharts. LitCharts LLC, 22 Jul 2013. Web. 11 Jan 2019. Fyfe, Paul. "A Tale of Two Cities Book 2, Chapter 13." LitCharts LLC, July 22, 2013. 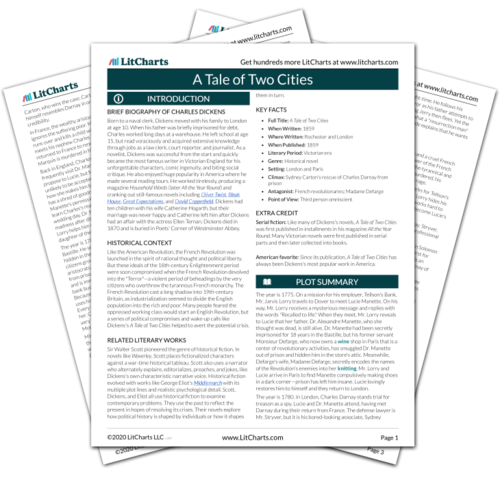 Retrieved January 11, 2019. https://www.litcharts.com/lit/a-tale-of-two-cities/book-2-chapter-13.